GOLF COURSE VIEWS! HOME ESTATE AGENTS are privileged to offer to the market this superbly presented four bedroom detached family residence situated on the always popular Gleneagles Road. Overlooking the prestigious Davyhulme Golf club to the front & boasting a rear garden that benefits from a sunny aspect, this property is a must view before even taking a look inside. Once your in the ground floor accommodation comprises entrance porch, welcoming hallway, bay fronted lounge, dining room, breakfast kitchen & downstairs WC. 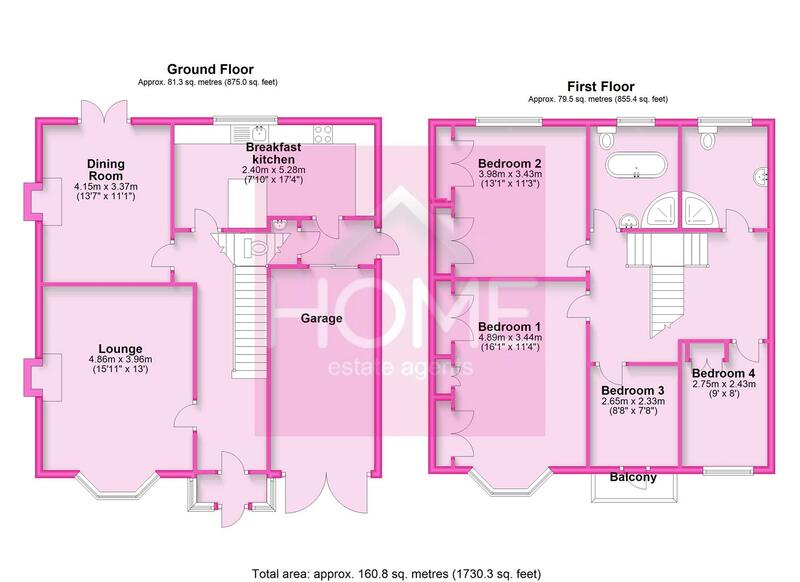 To the first floor there is a shaped landing, the four well proportioned bedrooms, three piece shower room & four piece family bathroom. The property is warmed by gas central heating & is fully uPVC double glazed. Externally to the front there is a generous block paved driveway which leads to the integral garage. To the rear there is a patio area, pathway & mainly lawned garden with mature beds. Ideally placed for Trafford General Hospital & the well regarded schools of the area. A credit to our clients! To book your viewing call HOME on 01617471177.
uPVC double glazed leaded door to the front with uPVC double glazed leaded windows on three sides. Tiled floor and entrance to the hallway. uPVC double glazed door to the front with uPVC double glazed surround. Wall lights, coved ceiling, radiator and understairs storage cupboard. 4.86 to the bay x 3.96 (15'11" to the bay x 12'11"
uPVC double glazed diamond leaded bay window to the front, coved ceiling, picture rail and television point. Sandstone fireplace with back and hearth housing a log burning stove. uPVC double glazed French doors leading to the rear garden. Picture rail and radiator. Feature fire surround with tiled back and hearth housing an open fireplace. A 'Neville Johnson' kitchen comprises comprehensive range of fitted wall and base units with a wooden effect rolled edged worktop over. Fitted peninsular with breakfast bar, wine rack and base units. Display cabinets and shelving. uPVC double glazed window to the rear, wood floor and radiator. Integrated five ring gas hob, double oven and extractor fan. A single unit sink with mixer tap. Space for other appliances. 'Rock' door to the side and uPVC double glazed top light. Tiled floor. A two piece suite comprises low level WC and wash hand basin with splash tiling. Tiled floor. uPVC double glazed diamond leaded bay window to the front. Picture rail and radiator. A comprehensive range of built in wardrobes with handing and shelving space. Fitted drawers and dresser. uPVC double glazed window to the rear, picture rail and radiator. A range of modern built in wardrobes with hanging and shelving space. Fitted drawers within. uPVC double glazed diamond door to the front leading to the balcony with matching uPVC double glazed diamond leaded either side. Wooden effect floor. 'Neville Johnson' fitted desk, storage units and drawers. uPVC double glazed diamond leaded window to the rear and radiator. Wooden effect floor. Fitted wardrobe with ample hanging and shelving space. A four piece period style suite comprises high flush WC, wash hand basin, shower cubicle and free standing footed rolled top bath. Tiled floor, period style towel radiator and uPVC double glazed opaque window to the rear. A three piece suite comprises low level WC, wash hand basin with storage below, storage cabinets with vanity lighting and shower cubicle. Period style towel radiator. Tiled floor and tiling to compliment. Spotlights and uPVC double glazed opaque window to the rear. Double doors to the front. Worcester gas central heating boiler. Power and lighting. Externally to the front there is a large block paved driveway providing ample off road parking which leads to the integral garage. To the side there is a block paved pathway giving access to the rear. To the rear which enjoys a sunny aspect there is an L-shaped paved patio area, pathway and mainly lawned garden beyond with mature beds. Well fenced for privacy. We have been advised by our clients that the property is Leasehold with a annual ground rent of £6.00 payable.